Led by seniors Jaide Parke and Morgan Parke, the Carey School girls’ varsity basketball team will head into the eight-team Northside Conference tournament with a first-round home game Saturday, Feb. 2. Carey’s league game at Richfield Tuesday finalized the regular season slate and the seedings for the upcoming Northside meet, but coach Merrilee Sears’ Panthers (11-6, 5-1 league) have earned their home tourney game by finishing among the top four teams. Game time is 7 p.m. Saturday on the Carey hardwoods. The favored Dietrich Blue Devils (18-0, 5-0 league) won at home over Richfield (12-5, 4-1) by a 43-30 score Saturday and improved their three-season winning streak to 46 games. After another round of games at the home of higher seeded teams Monday, Feb. 4, the double elimination tourney moves to Gooding High School for further games Feb. 5-7. The top two teams automatically qualify for the State 1A Division 2 tournament Feb. 14 at Nampa High School, while the third-place team must win a Feb. 9 state play-in game at American Falls to advance to state. On the verge of its league tournament, the Wood River High School girls’ varsity basketball team put together its best offensive performance of the season Thursday in a 49-37 “Senior Night” win over Buhl. Senior Hannah Belloli (5.5 ppg) was on fire from the perimeter with five 3-pointers and a career-best 17 points plus 6 rebounds, 4 steals, 2 assists and 1 blocked shot as Wood River (28.3 ppg offense) won at home for the first time. Another Wolverine senior, leading scorer Sydney Tidwell (10.0 ppg) tallied 12 of her 17 points in the second half and finished with 8 boards and 3 blocks. The third senior, Kennedie Howard, enjoyed one of her best nights with 4 points and 3 assists. Belloli scored 8 points in the second quarter and sophomore post Rory Cole (4 points) pulled down 5 of her game-high 15 rebounds in the second as Wood River (only 11 turnovers) built its biggest halftime lead, 22-14. The Wolverines dominated the glass, out-boarding Buhl 36-19. The victory for coach Matt Newhouse’s Wolverines (3-15, 1-9 league) snapped a three-game losing skid and swept the season series with Buhl. Other contributors were Ciceley Peavey 7 points, 3 boards, 3 steals and 4 assists; Sammi Sutton 2 rebounds, 2 steals, 3 assists and 2 blocks; Giselle Andrade 2 rebounds; and Brittney Bradley 2 assists. Topping Buhl were Kennedy Bowman 11 points/4 rebounds, and Natalie Morse 9 points. The six-team GBC league tournament opened Tuesday with No. 6 seed Wood River traveling to No. 3 Minico (8-12, 5-5) and No. 4 Jerome (11-9, 5-5) hosting No. 5 Canyon Ridge (3-17, 1-9). If the seeds held up, the Wolverines with a Tuesday loss would visit Canyon Ridge in Twin Falls Thursday, Jan. 31 at 7 p.m. in a loser-out game of the double elimination meet. The host Oakley Hornets (5-9) broke open a close game with a 19-7 fourth-quarter surge and pulled off a rare win over the Carey School boys’ varsity basketball team Friday—snapping Carey’s seven-game winning streak. It was Oakley’s first win over Carey since 2004. Gerrit Wybenga and Myck Sagers led Oakley with 14 and 11 points respectively. Carey, averaging 39% field shooting for the season, shot 31% and was out-rebounded 31-25. Leading Carey scorer Nate Adamson (14 points, 3 assists, 4 steals) ended up fouling out. Other Carey contributors at Oakley included Joe Parke (7 points, 4 rebounds), Jordan Dilworth (6 points, 3 boards, 4 assists), Sheldon Hansen (6 points, 6 rebounds) and Matt Whitworth (5 points). Thursday night, the Carey boys (11-6, 6-0 league) stayed unbeaten in the Northside Conference with a 65-27 home win over Bliss. Nine different Panthers scored as Carey shot 44% from the field and out-rebounded the Bears 29-14. Contributors were Dilworth (14 points, 7 rebounds), Hansen (11 points), Whitworth (11 points, 5 boards), Parke (8 points, 3 rebounds), Adamson (7 points, 3 assists, 2 steals), Poncho Gamino (5 points, 4 boards), Gunner Thompson (5 points, 3 rebounds), Luis Garcia (2 points, 3 steals) and Glen Andrews (2 points, 3 rebounds). 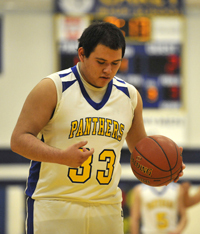 The Panthers visit Hagerman Saturday, Feb. 2 for a 1:30 p.m. varsity tip-off. Wood River High will honor retired teacher and boys’ basketball coach Jim Boatwright during “Senior Night” for the Wolverine boys’ basketball team Wednesday, Feb. 6 in games against the Minico Spartans at the Hailey gym. For the last nine years, Boatwright has conducted his Snowline Summer Basketball Camp in Hailey. He was assistant boys’ basketball coach to Fred Trenkle at Wood River for three seasons from 2003-06. Boatwright will be honored at halftime of next Wednesday’s boys’ basketball game. The Wolverine senior boys’ basketball players and cheerleaders and their parents will be saluted before the game. Meanwhile, coach Andy Miles’ Wolverines (5-10, 1-6 league) will try to bounce back from back-to-back home losses to Burley and Twin Falls (12-4, 7-0) when they travel to Jerome (9-5, 3-3) today, Wednesday, Jan. 30. The Wolverines go to Canyon Ridge (0-16, 0-6) Friday. Eron Bates (10 points), Kevin Hernandez (9) and Cody Carter (8, two 3-pointers) led Wood River in its 62-37 home loss to Twin Falls Friday.